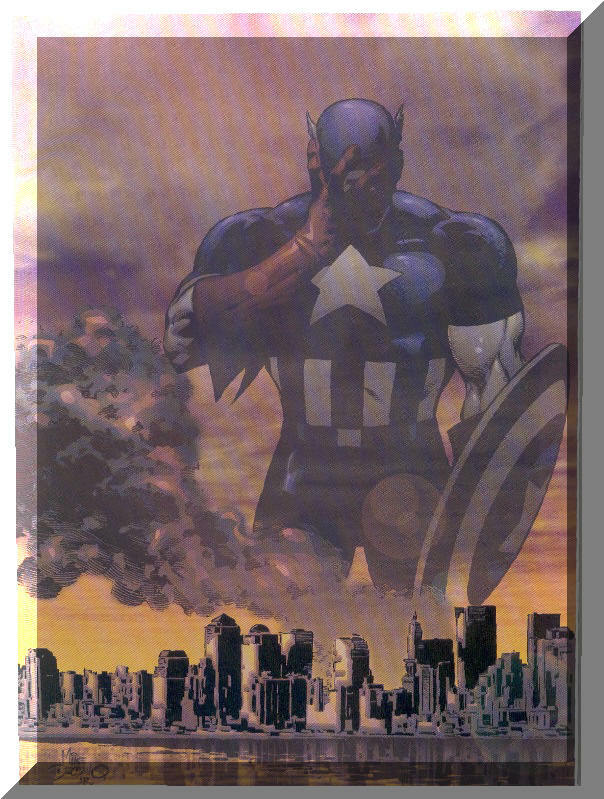 As I opened the Marvel Comic Book tribute to the heroes of 09-11-01, I felt the impact of the tragedy and, simultaneously, the glory of the heroism that fateful day well in me. Marvel Comic Books, famous for its string of Super Heroes who protect the children and the world from harm—their version of Sentinels of Vigilance—paid a glorious tribute to all the heroic events of 09-11-01. In the opening picture we see Captain America crying over the loss of lives, saddened by the horrid impact the terrorists have made upon the land, and especially the children. The picture, to me, represented the sadness of America. Perhaps it symbolized the Complacency we, as a great and safe nation, enjoyed in our belief we were impregnable. Then, suddenly, that belief was shattered. 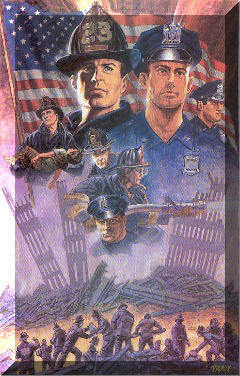 Throughout the memorial issue, pictures depict the heroism of the citizens of America. 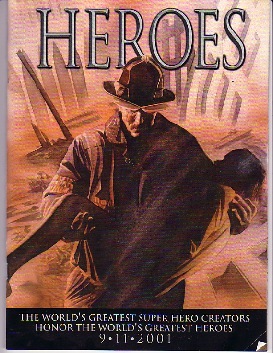 The comic book shows how the Super Heroes were the police and firefighters and emergency workers who risked their lives to save the innocent victims of the worst tragedy in our history. Tears wended their way to my eyes as I turned the pages, and realized the Marvel Comic Book team had so elegantly and profoundly brought the message of Vigilance to those who had eyes to see. 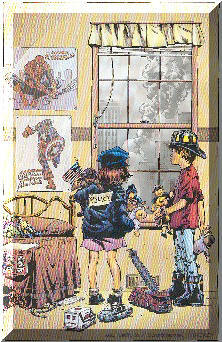 The picture of the two young children looking out their window as they played fireman and policewoman, stirred me. Here were children looking at the face of Terror, suddenly unsure about the world of security around them—feeling vulnerable, perhaps alienated by the unknown “evil” that could reach its ugly hand across time and space and smash the heart of America’s majesty. Then there was the picture of the woman and child, sitting in the dark next to the telephone, waiting for a call about their father and husband—who, as a Sentinel of Vigilance—had given his life for them and others. Who would now protect them? What impact would the insecurity leave on the child? On the mother? I wondered. I hoped. This picture saddened me as I thought of all the parents, uncles, aunts, cousins, nephews and nieces of those who were lost that day waiting by the phone, waiting to hear reassuring words that never came. The pages showed the destruction, the horror, the glory, the heroism. It was one of the finest tributes to the fallen and those who saved, and tried to save the victims, I have ever seen. 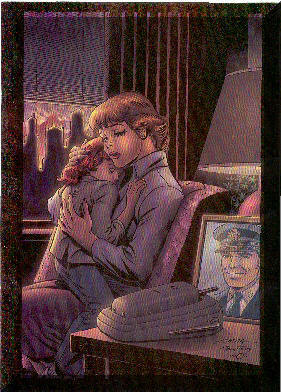 Marvel Comic Books realized the greatest scar tissue of Terrorism is the impact on the child, and the presence of a child in the arms of the fireman extols the need for vigilance within all our hearts and actions. It made me realize the importance of the Parents Of Vigilance. And the picture of the children from all countries, holding a vigil, sitting in a circle around the candles as the Parents of Vigilance looked on, was superbly stirring. Again, our focus in the battle for Terrorism must be upon the children—it must be our adherence to the principle of Semper Vigilantes—Always Vigilant—never letting up on our concern to protect children—our legacy of life—from those “evil ones” who would rip the entrails out of all the innocent in the name of whatever cause they sought. A day there was of monumental villainy. A day when a great nation lost its innocence and naked evil stood revealed before a stunned and shattered world. A day there was when a serpent struck a sleeping giant, a giant who will sleep no more. Soon shall the serpent know the wrath of the mighty, the vengeance of the just. A day there was when Liberty lost her heart—and found the strength within her soul. 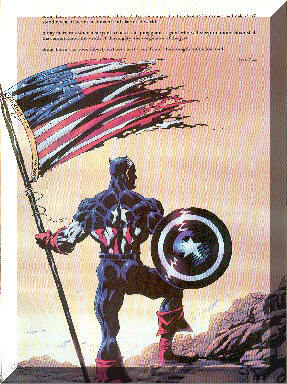 I salute Marvel Comic Books. I salute them for reinstating the need and power of Sentinels of Vigilance. I urge everyone to get a copy of this powerful tribute. Keep it as a reminder and a tribute to remaining Semper Vigilantes—Always Vigilant—so that the “sleeping giant” that Stan Lee wrote about will never shut its eyes again. In the July 17 issue of the 1943 edition of The New Yorker Magazine, the picture below ran as a symbol of fighting terrorism in children. What I found interesting about the difference between 1943 and 2001, was that our attention fifty-eight years later is not on the safety of a child. The American consciousness today isn’t focused dramatically on the sleeping child. In the 1943 cartoon, the artist summed up the war’s Terrorism, and the need to fight the enemy at home, by depicting the happy child’s security being threatened and a Sentinel of Vigilance protecting it. In 2001 I find the absence of this kind of theme disturbing. I hear the President and news pundits bellowing out all kinds of “war rhetoric,” but conspicuously absent is the primary focus of any war—protecting the children from harm. The words may be spoken from time to time, but the focus does not center on the children. This 1943 New Yorker magazine cover struck me, as a parent and grandparent, as getting directly to the point. When I am asked what I think of the war on Terrorism, I tell people: “It is right and just.” And I’m not necessarily endorsing the bombs and bullets and mass military funds being expended to destroy people in far away lands. I’m specifically referring to the Terrorism that must be fought inside a child’s mind—the terror of being neglected, of being left alone to sort out the reasons for war. While it may be easy for people to think of “war” as a response of aggression to thwart aggression, war should have a much larger and more generational value. If it doesn't, it cannot justify the cost it imposes on a society and the world. To me, justifying the war on Terrorism is justifying the need to fight terrorism in the minds of children. Anything less is political fodder. Only when we, as parents, can see the benefit of protecting our children from the ravages of “emotional terrorism,” not only from without, but from within, have we truly justified the need for a “war.” Physical terrorism is not a war that can be won. Any "crazy" with an agenda can wage such a war. But "emotional" Terrorism can be won. We can put smiles on sleeping children's faces in the face of the most critical and threatening moments. This war, however, is not won on the battlefields of distant lands alone. Its true battlefield rests upon teaching a child to replace fear with courage, intimidation with conviction, and complacency with action. These Shields of Vigilance can only be taught by example. 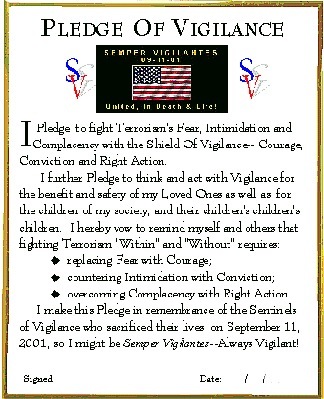 This charges parents, grandparents, brothers, sisters, aunts, uncles, cousins, nephews, nieces and other loved ones of children with the duty and responsibility to stand up to Terrorism on the home front. Standing up to Terrorism begins with recognizing what it is. It is Fear, Intimidation and Complacency. Secondly, it means that to counter the assault Terrorism brings upon a child, Parents of Vigilance, must neutralize Fear, Intimidation and Complacency with Courage, Conviction and Action. We must take a stand visible enough for a child to recognize that as parents we are fighting the threats against the child; we are being Semper Vigilantes—Always Vigilant-- against those forces, both physical and emotional, which threaten a child’s welfare. On the magazine cover of 1943, we see the child is smiling, happy, joyous, free. The reason he or she is happy is because the parents have helped him or her to understand how to deal with, to not neglect fears and intimidations. The artist, intentionally or by accident, put the responsibility for the child’s happiness on the parents who the child in, and told him or her that the Sentinels of Vigilance were standing guard, and discussed with him or her how to stand up to fear and intimidation. Peace comes only from security. In this case, the artist crafted peace in the child’s mind, while displaying the ravages of war above the child. For those who might think the cartoon is terrible because in the dream, the child is the pilot of the plane fighting the “Evil Nazis”—think about it?. How does a child interpret a Sentinel of Vigilance? Would he or she not want to become one? Would he or she not want to protect his or her own children from harm? Anti-war activists and anti-violence advocates--while broadcasting their stalwart stand against war or violence--would not sit back in peace and restraint if their children were being attacked by some evil force. They would, by any means possible, seek to protect those children. If they didn’t, they would violate the “prime directive” of human nature—and that is to protect the children from harm. The child in the dream has become his or her own Sentinel of Vigilance. If we were to redraw the picture, we might see the child smiling, and instead of shooting down German planes, see the child standing up to a bully with a smile on his or her face. Or, we might see the child smiling while others called him or her fat, or ugly, or poor, or stupid, or laughing at the child at his or her expense. We would see Courage, Conviction and Action replacing Fear, Intimidation and Complacency. The point is--are we, as Parents of Vigilance, thinking and acting solely to protect the child from fear? As Parents of Vigilance, is it in the best interests of the child to tell the child that our government is protecting him or her? That our Home Security Forces are in charge, and abdicate personal protection to government? Or, should we teach a child that Vigilance is the key to sleeping with a smile? Facing one’s fear courageously, as this child is doing, is the essence of battling Terrorism. Not being intimidated is the result. And taking Action is the engine that sets the result into motion. I ask you to think about how your children sleep at night. Do they have smiles on their faces because they know their mother and father are standing up to Terrorism in the home? Or, do they sleep with a frown, not sure who will protect them from Terrorism’s insidious impact? If you truly subscribe to being a Parent of Vigilance, your child will sleep with a smile. And, so will you. Go To November 13 --"The Cancer of Terrorism --The Chemotherapy of Vigilance"